"I Hope to turn my visions into reality. I could capture this space," he says, gesturing to nearby rooftops,"and turn in into patches of green." The area around Tai Koo is known as a middle-class neighborhood. But on its outskirts, a handful of industrial buildings stand among the clusters of residences and shopping malls. These aged buildings look dilapidated and colorless. But if you climb up the stairs of Eastern Center, one of the factory buildings in the area, the view is an incongruous surprise: a group of urban farmers have carefully grown crops on its roof—and their hard work has turned the gray space of barren concrete into vibrant shades of green. 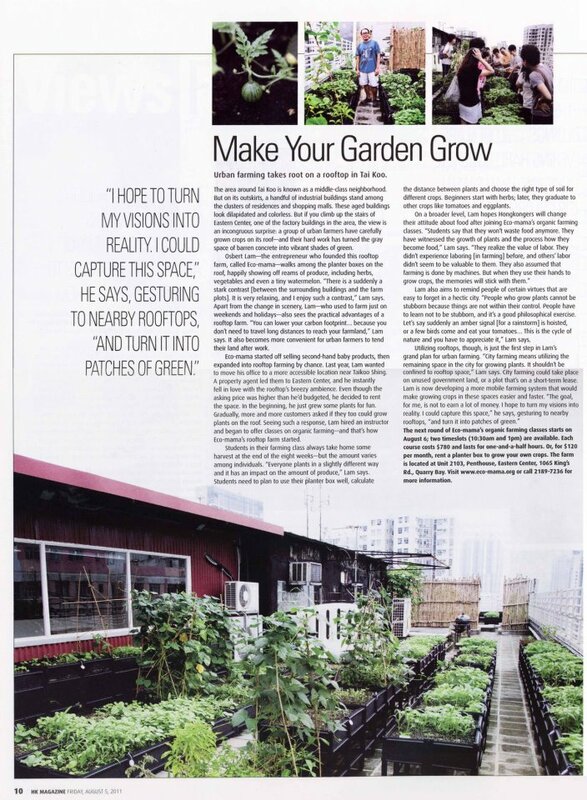 Osbert Lam—the entrepreneur who founded this rooftop farm, called Eco-mama—walks among the planter boxes on the roof, happily showing off reams of produce, including herbs, vegetables and even a tiny watermelon. “There is a suddenly a stark contrast [between the surrounding buildings and the farm plots]. It is very relaxing, and I enjoy such a contrast,” Lam says. Apart from the change in scenery, Lam—who used to farm just on weekends and holidays—also sees the practical advantages of a rooftop farm. “You can lower your carbon footprint… because you don’t need to travel long distances to reach your farmland,” Lam says. It also becomes more convenient for urban farmers to tend their land after work. Eco-mama started off selling second-hand baby products, then expanded into rooftop farming by chance. Last year, Lam wanted to move his office to a more accessible location near Taikoo Shing. A property agent led them to Eastern Center, and he instantly fell in love with the rooftop’s breezy ambience. Even though the asking price was higher than he’d budgeted, he decided to rent the space. In the beginning, he just grew some plants for fun. Gradually, more and more customers asked if they too could grow plants on the roof. Seeing such a response, Lam hired an instructor and began to offer classes on organic farming—and that’s how Eco-mama’s rooftop farm started. Students in their farming class always take home some harvest at the end of the eight weeks—but the amount varies among individuals. “Everyone plants in a slightly different way and it has an impact on the amount of produce,” Lam says. Students need to plan to use their planter box well, calculate the distance between plants and choose the right type of soil for different crops. Beginners start with herbs; later, they graduate to other crops like tomatoes and eggplants. Lam also aims to remind people of certain virtues that are easy to forget in a hectic city. “People who grow plants cannot be stubborn because things are not within their control. People have to learn not to be stubborn, and it’s a good philosophical exercise. Let’s say suddenly an amber signal [for a rainstorm] is hoisted, or a few birds come and eat your tomatoes… This is the cycle of nature and you have to appreciate it,” Lam says. The next round of Eco-mama’s organic farming classes starts on August 6; two timeslots (10:30am and 1pm) are available. Each course costs $780 and lasts for one-and-a-half hours. Or, for $120 per month, rent a planter box to grow your own crops. The farm is located at Unit 2103, Penthouse, Eastern Center, 1065 King’s Rd., Quarry Bay. Visit www.eco-mama.org or call 2189-7236 for more information.